Short Review: The Gimono 'Grappling' gi is aimed at grapplers from a wide variety of martial arts, rather than intended for specific competition criteria. It would therefore not pass muster in either a typical BJJ or judo tournament: nevertheless, it's a very comfortable training gi. 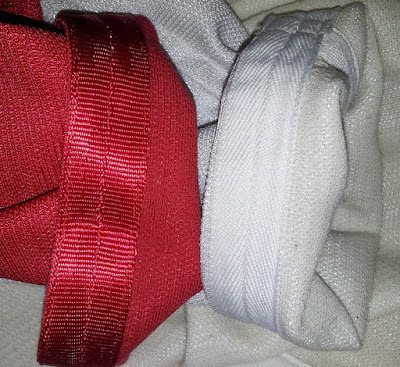 The cut is essentially the same as a judogi, but with 3/4 length sleeves. The trousers are also shorter than standard judo trousers, but it is possible to mix and match sizes to your preference. I'm wearing a size 3 jacket and size 4 trousers: for reference, I'm 5'7 and 66kg/145lbs. It's made from the same 330gsm material as the Gimono 'BJJ' gi I reviewed in 2012, dubbed 'Fortitude' (36% merino wool and 64% polyester). This means those same advantages of being very light, hydroscopic, fast-drying and comfortable apply to the Gimono Grappling gi. The jacket is heavily reinforced by comparison to the BJJ gi. Best of all, it's available in a magnificent shade of red. It has the same disadvantages as the other gi too, in that the collar is quite thin and the price tag could be off-putting. However, if the Fortitude material is as durable as the website claims, then that cost is arguably justified. Available to buy in blue, red, white or black here for NZD $295, which at the time of writing equates to £127 ($201) before tax and customs. Full Review: Ever since I received the Gimono BJJ gi to review three years ago, it has been my main travel and hot weather kimono. The unusual combination of merino wool and polyester is wonderfully comfortable, dries fast and doesn't crease easily. This material, dubbed 'Fortitude' by Gimono (much more on that in the Gimono 'BJJ' gi review, probably my most detailed gi review to date) is available in numerous different gi cuts. Three of them are for grappling: the BJJ cut, a judo cut and the 'grappling' cut I'm reviewing today. The only difference between our grappling gi and the judo gi is sleeve length. The grappling gi sleeve is 3/4 length. As you know, competition BJJ and judo both have regulation sleeve lengths. We introduced the grappling gi to offer an alternative for those who aren’t so concerned about competition or rules, but who are into training any of the grappling based arts. It’s been quite a popular style. We’ve found some people who train in ninjutsu and aikido prefer the shorter sleeve, so like all our gi, it has found its place in the market without us needing to be prescriptive about it. The Gimono website hasn't changed much in three years: I would have expected a more representative picture of the BJJ gi cut by this point. The current pictures don't do that gi justice. However, the other cuts have a more extensive selection. 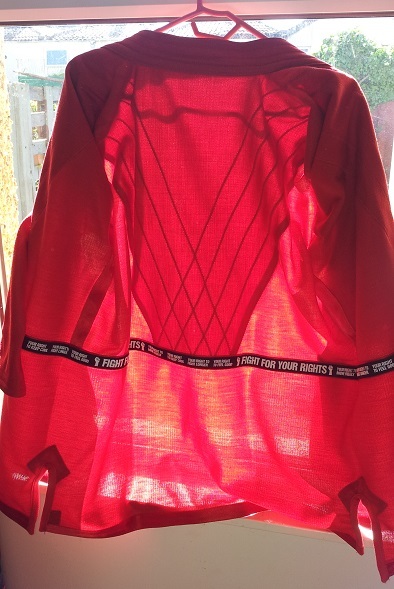 Tellingly, that includes a picture of somebody wearing the Grappling gi jacket with just shorts, indicating a practitioner of SAMBO might be interested in wearing this gi. While we don’t currently have any formal sponsorships in place, we have supported a number of individual instructors and teams ‘in kind’ with free Gimono gi’s. We sponsored the NZ qualifiers for the Abu Dhabi Pro JJ championships that were organised by Douglas Santos; recently, a team of NZ instructors and black belts have been to the USA to attend the world championships of Jeff Speakman's 5.0 Kenpo Karate. All wore Gimono karate gi; we gifted t-shirts and a couple of free uniforms to show our support. We’ve provided similar support to a few other school owners/instructors teaching aikido, ninjutsu, Japanese jiu jitsu, and various forms of karate. Our philosophy is to support those who are open minded and not necessarily tied to traditional ways of thinking. Word of mouth has had a phenomenally positive impact on the adoption of Gimono in various martial arts communities, and we have embraced the opportunity to supply gi’s for reviews and/or sampling. We respect the heritage and tradition of the martial arts, but we’re also pushing conventional boundaries so we don’t expect to our product to be accepted by everyone. 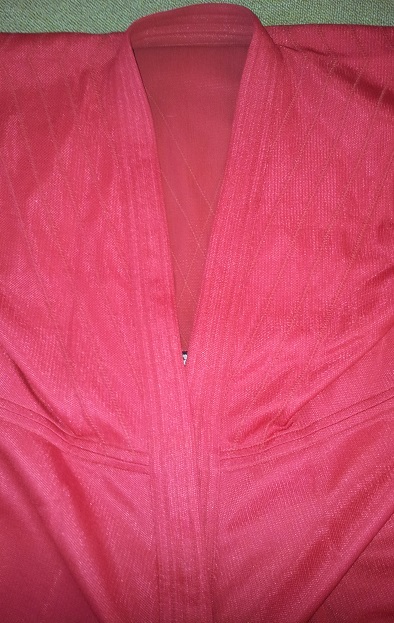 My favourite aspect of the gi is the brilliant red colour. Unlike in 2012, I am now keen on wearing a gi that is as colourful as possible. I can confirm that it is possible (though not recommended by the company) to dye the Fortitude material, but due to the higher concentration of polyester on the outer layer, the exterior will end up a lighter shade. I could see that contrast clearly after putting my white Gimono BJJ gi into the washing machine with two packs of Dylon 'French Lavender'. The outside is now a subtle shade of purple (hard to see in a photo, but for reference the bannister in the picture is white), while the inside took the dye far better. I would suggest darker shades of dye would be advisable if you're hoping for a vibrant colour. The Grappling gi has shorter sleeves and trousers than the judogi cut from which it was adapted. Calvert recommended that rather than the size 3 I went for last time with the BJJ cut, I combine a size 3 grappling cut jacket with a size 4 pair of trousers. You can buy jacket and trousers separately, a big plus point if your body type does not match orthodox 'off the shelf' gi options. I found that my Gimono grappling gi was a decent fit, if baggier than the BJJ cut. The drawstring was rather long, but that's easily resolved by chopping it to the length you want, then singeing the end to prevent fraying. I did not notice any significant shrinkage, in keeping with the Gimono website's promise that it won't "shrink, stink, tear or fade". 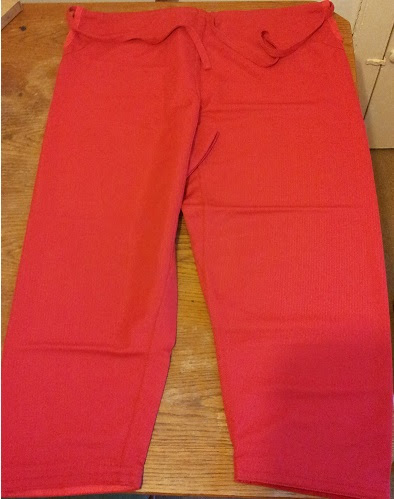 The trousers are 88cm long, while the jacket is 82cm from shoulder to hem. It has a wingspan of 147cm. It's worth noting here that the Fortitude material (330gsm, in case you're wondering) is a little stretchy, as my sparring partner commented on Sunday after I rolled with him in the Gimono Grappling gi. That adds further to the comfort. Like the BJJ cut, this gi doesn't weigh much, coming in at 1.4kg. It is packaged in the same Gimono bag as before, roughly the dimensions of a shoe box: that tells you how tightly this gi will roll together, perfect for travel. The Gimono Grappling jacket has a prominent stitching pattern of diagonal lines on either side, forming a chevron at the front. That's because the grappling cut has a heavily reinforced jacket. All that stitching is there in order to secure the thick strips of material flowing up the front of the jacket, over the shoulders, then down the back. Speaking as somebody who has sewn a patch onto the left chest area, I know it's good and thick: it took a lot of shoving to get the needle through. You can see this thickness clearly when the gi is held up to the sunshine, which also indicates the gi's breathability (an attribute not perceptibly affected by the extra material). In my photo where I've hung it in front of a window, the gi is inside out, which is why the inner black strip is showing. I would assume that the grappling cut's additional fabric (and this presumably goes for the judo cut too) results in increased durability over the BJJ cut. Although it means this area of the grappling gi is thicker than the BJJ cut, it still overall feels thinner than a typical cotton gi. It's been really hot for the UK recently (around 28 degrees), but the Gimono Grappling gi has kept me cool during training. That thin collar has been mentioned a few times in the past and Gimono are working to address the criticism. Personally I haven't found it to be a major issue, in three years of wearing the BJJ cut and three months of testing the grappling cut. That's borne out by a point Lavinia Calvert made in her email, stating that "In 5+ years of trading, we have only had two people return their Gimono gi after purchase. One just couldn’t get their head around how different it was (his girlfriend bought it for him); the other didn’t like the thinness of the lapel/collar, an issue we have worked hard to address as you know." Available to buy in blue, red, white or black here for NZD $295, which at the time of writing equates to £127 ($201) before shipping and any import taxes your country of residence whacks on top. The exchange rate between the UK/USA and New Zealand has improved quite a bit in three years, as the price is now comparable to a high end cotton gi and no more expensive than a hemp gi. Of course, if you don't live in Australasia, customs and tax may be hefty. Incidentally, my Gimono BJJ gi is still as good as new after three years, so that bodes well for the durability claims (though admittedly until recently I mainly reserved it for travel).